Not sure how to meet your kids’ nutritional needs? We’ve got answers! To raise healthy eaters, it is important to not only model healthy habits, but also teach healthy eating skills. Everyone needs a refresher course now and then. See which tip could benefit your family and get started this week! Be sure to write your goal down and put it up on the fridge, so it doesn’t become a disappearing thought or intention. Be adventurous & try something new. That means you too! 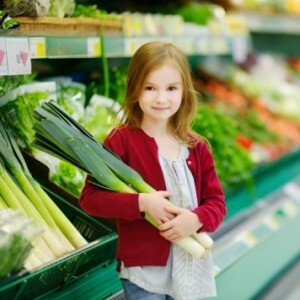 Your child’s favorite vegetable could be something you hated as a child or even dislike to this day. Encourage your kids to be adventurous with food. Explain how our tastes change and expand over time, so they should never rule out foods they “think” they won’t like. Hesitance to try new foods is developmentally appropriate in young kids, so do not be concerned if your child is a cautious eater right now. They just need your guidance and patience when learning to like unfamiliar flavors. Be sure to applaud their progress whenever they try new food, even just a bite. Incentivize trying new vegetables with a sticker reward. Try different shapes, sizes, temperatures, and textures of healthy foods -find out how. Aim for at least 4 colors a day! Brown (walnuts), black (black beans) and white (cauliflower) count too! 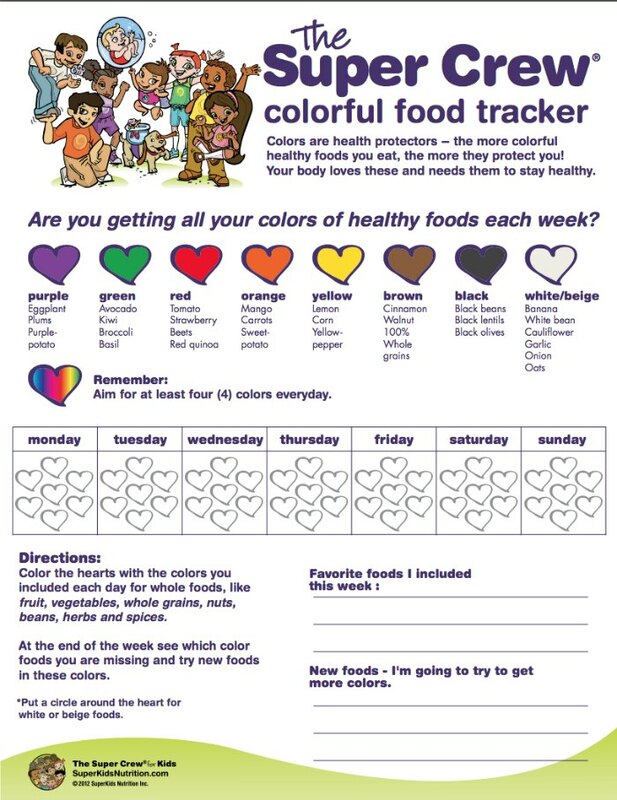 Have the whole family track how many colors of fruits and vegetables they eat each day using the Super Crew Color Tracker. The person who ate the most colors wins a prize! 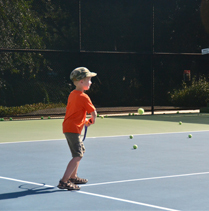 Make the prize healthy and fun, such as a new Frisbee, Wii Fit video game, or workout clothes. Explain the importance of eating a rainbow of colors by using the Super Crew characters. It is never too early to start explaining the difference between hunger and fullness or to get your child excited about healthy eating. Teach your kids to be in tune with their hunger and satiety signals so they know when to start and stop eating. Have them practice asking themselves these questions to tune into their unique body sensations. How do I feel when I am hungry? What does my stomach feel like, and how do I act? Does hunger crop up in other ways, such as changes in my behavior or mood? Ask yourself this question if you are unsure whether you are feeling true hunger, or whether you are using food to satisfy other needs: Would fresh fruit taste delicious right now? Just as delicious as a cookie? If not, am I just bored, tired, stressed, or something else? If you are not truly hungry, look for another activity to satisfy yourself that does not involve food. How good does food taste when I first start eating it, compared to when I’m almost finished? How does my stomach feel when I’m full? How do my energy levels change after I eat? How about my mood? Learn to find your happy full-point where you are satiated but not uncomfortably stuffed. Read the Top 10 Mindful Eating Tips for Kids. Keep portions in check by using MyPlate. Work with your kids to divide their dinner plate into sections, using MyPlate as a guide. 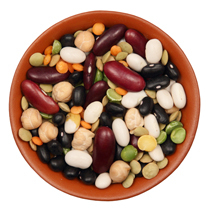 Fill half the plate with fruits and veggies, one quarter with protein, and one quarter with starch. This will help your kids learn how to compose a healthy well-balanced meal rich in phytochemicals. Stress the importance of doing this exercise when they eat outside of the home. Watch out! Don’t let commercials fool you. Teach your kids to be ad-savvy. Explain to your kids that THEY choose the foods they want to eat, not the cartoon characters on TV. Learn how marketers are finding sneaky ways to reach your children. Characters and toys are just for playing, not for telling them what to eat. For example, try saying, “Tony the Tiger is a fun tiger, but HE can eat the Frosted Flakes that will make him feel weak and tired, not you! You can love Tony the Tiger and still eat other foods that will make you big and strong!” Start by introducing your child to the Super Crew & all the superpowers they gain through healthy eating. Read your children stories about the Super Crew to reinforce healthy eating habits and encourage your kids to make nutritious food choices.